České Velenice (Czech pronunciation: [ˈtʃɛskɛː ˈvɛlɛɲɪtsɛ], German: Unterwielands, Gmünd-Wielands, Gmünd-Bahnhof, 1938–45: Gmünd III)) is a town in the Jindřichův Hradec District of South Bohemian Region of the Czech Republic, just on the border with neighbouring Gmünd, Austria. The area constituting current České Velenice was just the north-west part of the Austrian town of Gmünd, including the main station and the factory for repairing rolling stock and locomotives, established in 1868 and damaged during World War II by USA air strikes. 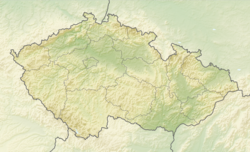 But at the end of World War I the 1919 Treaty of Saint-Germain awarded it to Czechoslovakia and became the new municipality of České Velenice. The development of this border area between Bohemia and Austria was decisively increased by the inauguration of the Emperor Franz Joseph Railway connecting Vienna to Prague in 1869. Today, the railway line has only regional significance, as the main line runs via Wien Meidling and Brno, along the first Czech railway corridor. This page was last edited on 2 November 2018, at 04:02 (UTC).